Pierate - Pie Reviews: Hap-pie American National Pie Day 2018! Hap-pie National Pie Day to our American Friends!! Yes, today 23rd January is America's National Pie Day and (as with a lot of things Stateside) the Brits love any excuse to jump on board with American food days and festivals! (Any excuse to eat pie really!!) But it must not be forgotten that while in America they dedicate just a day to pie, here in Britain we need a whole WEEK!!! Step up to the plate British Pie Week, which is now just a few weeks away, and here at Pierate - Pie Reviews we'll once again be the leading promoter of the pie in British Pie Week! Featuring a pie design, knife, fork and the date, you may have spotted recently we launched a British Pie Week 2018 logo. We've kept it simple but effective and we are happy for any websites, companies or other sources to use the logo for free. Unlike the previous commercial logo, we're not looking to promote our brand or product, but simply want a logo that focuses on the pie and puts the pie back into the centre of British Pie Week! For those that don't know, we at Pierate Pie Reviews are a few friends who love pies and want to see them recognised for what they are - the piefect heart warming meal or snack in a pastry parcel! It just so happens that we've rated well over 600 pies in the process! 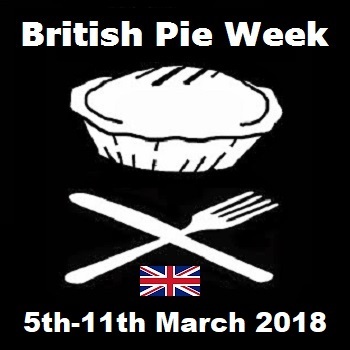 And we once again plan to be at the heart of British Pie Week 2018 - which is this year from Monday 5th to Sunday 11th March - and you can follow our adventures on Twitter and this blog throughout the week, as we once again do our daily Pie Week Diary. 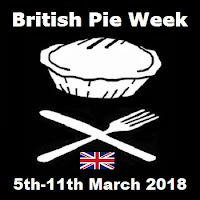 For more information about British Pie Week, join the thousands of readers of our "British Pie Week - Everything you should know!" article from a year ago! "Chicago Get These Royally Good Pies" - Our Pierate Highly Recommended Steak and Ale Pie Review from Pleasant House Pub in Chicago, who serve Royal Pies!